When her new bakery was vandalized in the riots that rocked Ferguson on Monday night, Natalie Dubose turned to a crowdfunding page to raise $20,000 and get her bakery back up and running. Within one day, she netted more than $159,000 from roughly 5,000 backers. "Money came flowing in from people across the country, including Patricia Heaton of Everybody Loves Raymond, Brandi Glanville of Real Housewives of Beverly Hills and a"sweet lady who offered money from her social security check," Dubose wrote on her Gofundme page for Natalie's Cakes and More, adding: "I am so humbly blessed! Dubose, who started selling cakes at local flea markets as she saved up to open her small business this summer, said her storefront's main windows were smashed and the shop damaged during the riots. More rallies were expected Wednesday, with Londoners joining the movement. "I'm beside myself, but with the holidays, can't stop working," Dubose stated. 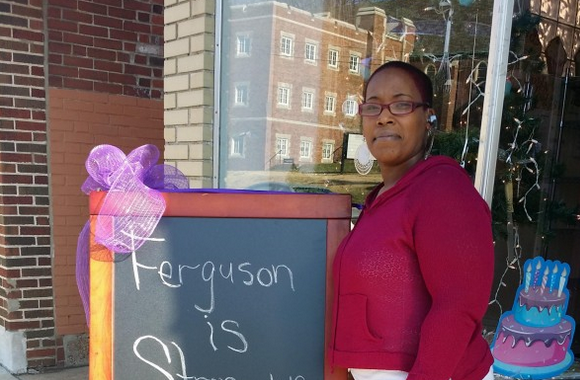 Dubose isn't the only one in Ferguson getting help from strangers online. Without the GoFundMe campaign, Dubose said she wouldn't know how she could find the money to repair her shop.